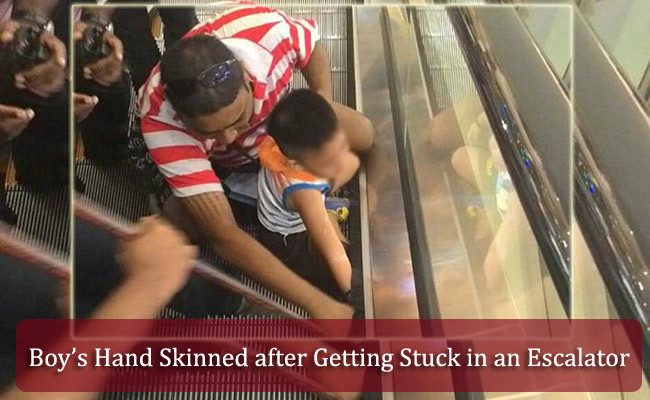 A three year old boy recently learned to be more careful when riding an escalator in a mall in Malaysia. The family were having a great time until the couple’s three year old son, Ng Juen Shen, had his hand stuck in the escalator. The family and the little boy were riding the escalator down towards the ground floor. The boy decided to sit and put his right hand at his side. Unnoticing the danger, soon his right hand was caught at the edge of the escalator. The mall’s security personnel immediately hit the emergency stop button as soon as the shouts of help from the father, Wei Kang, had surprised everyone inside the mall. Though the escalator was stopped, Juen Shen’s hand was not freed easily. It took the Fire and Rescue Department and the mall’s management some ten minutes to make the gap at the edge of the escalator wide enough for then to free the boy. The incident happened at around 6pm and many other shoppers heard the cries of the boy. His right hand was ripped off of its skin. His father said that there was too much blood and bones were peering already. After the boy was freed, his father immediately took him in the hospital Penang Hospital’s emergency ward. Wei Kang was suppose to take his family to the Esplanade for the Transformer’s exhibition after their trip at the mall. He added that he was looking after the boy’s younger brother while his wife ws suppose to be taking care of Juen Shen. Fortunately, the x-ray did not show any broken bone. The incident serves as a reminder to the parents and guardians to be more attentive to their children when riding the escalator.